Going to plan kid's friendly bathroom? 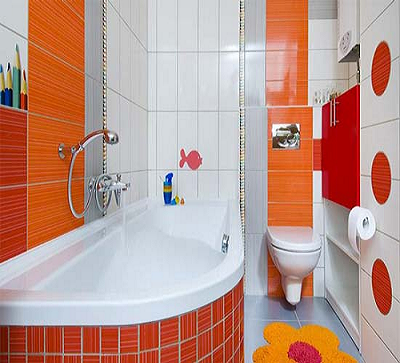 Here we are with some suggestion and guidelines which should be consider in designing kids bathroom. Read on How to plan kid's friendly bathroom to know all what you need to design a perfect bathroom for your little ones. There is nothing more exciting and challenging then planning something for kids and when it comes to bathroom planning for kids the job becomes more challenging as the kids grow up and will very soon tire of their baby bathroom. So planning for them really need a good budget and energy too. -	First of all kids bathroom should be readily accessible from kid's room and easy to clean. Surfaces should withstand splashing, spotting and dripping. -	Safety is the key issue in designing kids bathroom so when it comes to door locks choose the door locks which can be opened from outside. -	There is no need to go in for kid's size fixtures choose the standard one which can be accompanies with sturdy step stools or benches to bring the basins in reach of your kids for washing up and brushing teeth. Though you can install the Wash basin at lower height and change them according to height of your kids as they grow. -	Choose single handler faucets which are much easy to handle and safer than separate hot and cold water control, which require mixture to get desired temperature of water. -	Always install some fancy night lights with automatic on and off system which encourage your little ones to go in alone. It is good to have the switches for all light fixtures that can be operated by timers which will shut the units off if the children forget to do so. -	Low-height storage and shelves can be used to hold essentials like towels and bath toys so your child can easily reach out for them. Cubby style shelves are the best option for kids bathroom as you can store lots of items in it. It is best to add some storage under the wash basin which is ideal for small bathrooms as they do not have enough storage option. -	Wetness is the hazard for any bathroom but for kids bathroom is become more serious so it is better that the shower must be contained within wet area by a floor length shower curtain and foot tray. -	Decorate the walls of kids bathroom with their favorite cartoon characters to make it more inevitable. Use colorful bath accessories and shower curtains to make the decor adaptable. Add a painted sink, toy baskets and other Kid pleasing colorful accessories if space permits to get the perfect look. -	Flooring of the kids bathroom should be selected carefully, all kind of tiles, both ceramic and clay, marble, stone and slate can be used for flooring purpose. -	It is good to install quiet-close toilet seats which close quietly and can be unlatched from the toilet for easy removal and convenient cleaning. -	Use toilet and cabinet clamps to keep the kids from reaching to them and to lock up bathroom cleaners. -	It is good to spread shower mats in the area to avoid slippery floors. -	Install hand rails near the tub or toilet seat to make it easy for kids to get in and out. -	Never leave the drains uncovered, cove the drains with suitable to keep kids from reaching in and to keep the toys out. -	Install touchless faucets which is easy to handle for kids. We hope the above ideas and tips will help you to get more appealing, functional and aesthetic bathroom which serves its original function without the worries of changing trends and your child growth.